These are some of the many benefits of utilizing our Far Infrared sauna as part of overall recommended wellness program. During a 20-30 minute sauna session, your heart rate increases by 50-75%. This provides the same metabolic result as physical exercise. The increased cardiac load is the equivalent to a brisk walk. There is a nominal effect on blood pressure because the heat also causes blood vessels in skin to expand to accommodate increased blood flow. To repeat. Those that do not or cannot exercise can still receive incredible self-healing benefits for regular FIR sauna sweats. Toxins such as sodium, alcohol, nicotine, cholesterol and carcinogenic heavy metals (cadmium, lead, zinc, nickel) accumulate in the body during modern daily life. The body eliminates most toxins naturally by sweating. Heat therapy stimulates the sweat glands that cleanse and detoxify the skin. The heat simply speeds up the body’s natural process. Those that do not or cannot exercise can still receive incredible self-healing benefits. Arthritis Pain Relief. In Europe, radiant heat therapy is widely used to treat patients suffering from many forms of arthritis. The deep heat of our Infrared sauna helps peripheral blood vessels dilate, bringing relief and healing to muscle and soft tissue injuries. It has been proven effective in the treatment of sprains, neuralgia, bursitis, muscle spasms, joint stiffness and many other musculoskeletal ailments. Increased blood circulation carries off metabolic waste products and delivers oxygen-rich blood to depleted muscles so they recover faster. Muscles relax most readily when tissues are warm, promoting greater flexibility and range of motion. Much of the stiffness, aches and soreness that come with aging are reduced or eliminated. During a fever, the body heats up to eliminate viruses and attack foreign agents. This rise in temperature is a natural stage of the immune system’s healing process and is one of the best ways to rid the body of chemicals and unwelcome visitors. The combination of heat, extra water and the immune system weakens the hold of viruses and bacterial growth. Saunas induce an “artificial fever” by heating up the body but without the pains of an illness. Subsequently, the body wards off invading organisms much more easily because the immune system is activated consistently by the “artificial fever”. Far infrared saunas have shown to assist in weight loss, pain management, skin purification, detoxification and stress reduction. Far infrared saunas can also provide relief to patients suffering from arthritis, chronic fatigue syndrome, fibromyalgia, and certain skin conditions. Far infrared sauna therapy surrounds the body and penetrates deeply into joints, muscles and tissues, speeding oxygen flow and increasing circulation. Natural body healing with Far Infrared therapy leads to a healthier lifestyle for you and those around you. Our personnel and customer service staff are fully trained on the latest research and health benefits. Everyone on our staff is a Far Infrared Sauna Specialist. There are so many other features and differences about our sauna that cannot be explained in one page! Enjoy the comfort of warmth and cleanliness from the inside out. Far Infrared Saunas are Safe. Infrared light is part of the Sun’s invisible spectrum. One of far infrared light’s characteristics is the ability to easily penetrate human tissue. When this happens, it creates a natural resonance, which has many beneficial properties. Remember the last time you were sunbathing with sunscreen? Were you still hot? Of course you were because the sunscreen only stops the UV (Ultraviolet) light from hitting your skin. The far infrared heat (Far infrared light waves) penetrates your skin, giving you that wonderful natural warmth. All humans send and receive Far Infrared waves. The range of waves generated by the human body is 6 to 20 microns. The optimal micron output range is between 7 and 14 microns which is very close to the resonant frequency of a water molecule. This similarity makes sense since our bodies are almost 70% water. This range, sometimes called “Vital Rays” appears to have special regenerative effects on the body. 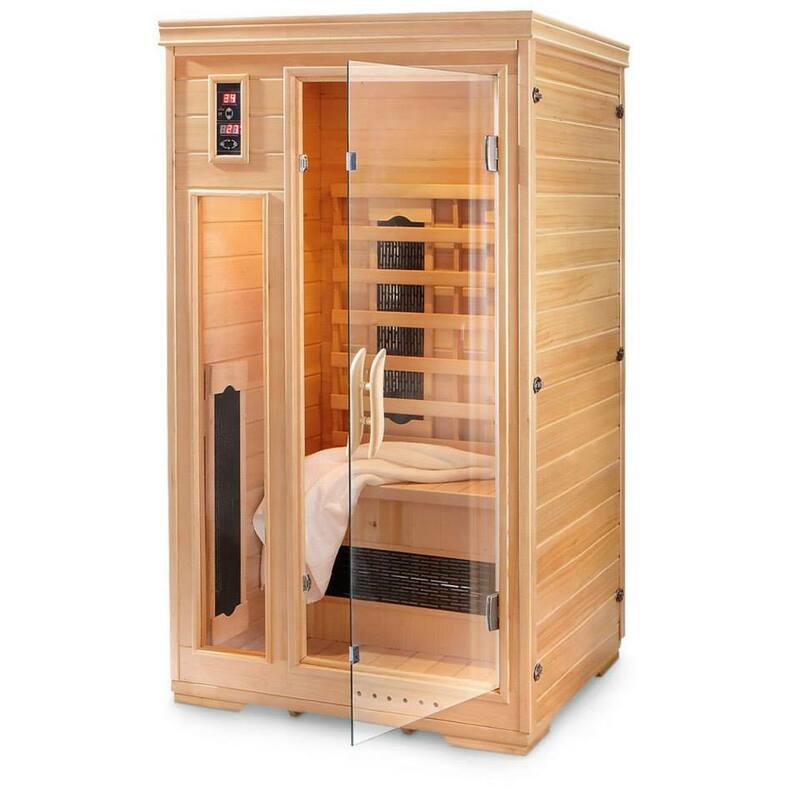 The result of, Far Infrared Saunas heater designs allows for better performance well within this vital wave range of 7 to 14 microns with a good portion of wavelengths at 9.4–which is the frequency at which a water molecule resonates or vibrates. This vibration causes a release of cellular toxins such as mercury, aluminum, cholesterol and other toxic gases such as sulfur and formaldehyde. This optimal micron output also allows for deeper penetration of Far infrared heat, which improves pain relief, detoxification, circulation, and increased peripheral blood flow. Finally, before your cleanse, we suggest you purchase and bring a skin brush to stimulate the skin, to release and shed old cells, and to assist in the process of reducing cellulite. Brushes are available for sale. Food: It is best to use the sauna when between meals: not overly hungry with low blood sugar or overly full. If it has been more than 3 hours since your last meal, it is advisable to eat a small snack 45 minutes to 1 hour before using the sauna. Water: On the days you will be using the sauna, be sure to drink plenty of clean filtered water. Drink 8 ounces before entering the sauna and 8-16 ounces while in the sauna. Continue to drink plenty of water several hours after your sauna sessions. You will be given a Emergen-C at the end of your session to replace electrolytes.